Notify me of new HIR pieces! Israeli Prime Minister Benjamin Netanyahu, in a speech to the World Zionist Congress, stated that Hajj Amin al Husseini, the founding father of the Palestinian movement, had convinced the Nazis to exterminate the European Jews. We examine here the evidence relevant to this claim. 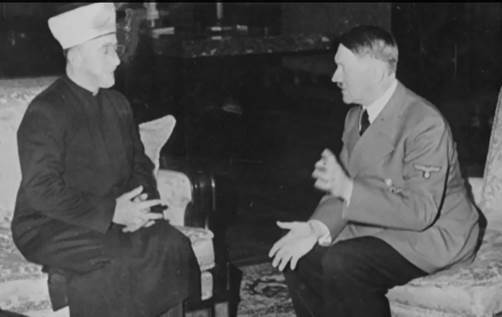 According to my own opinion, the Grand Mufti [Hajj Amin al Husseini], who has been in Berlin since 1941, played a role in the decision of the German Government to exterminate the European Jews, the importance of which must not be disregarded. 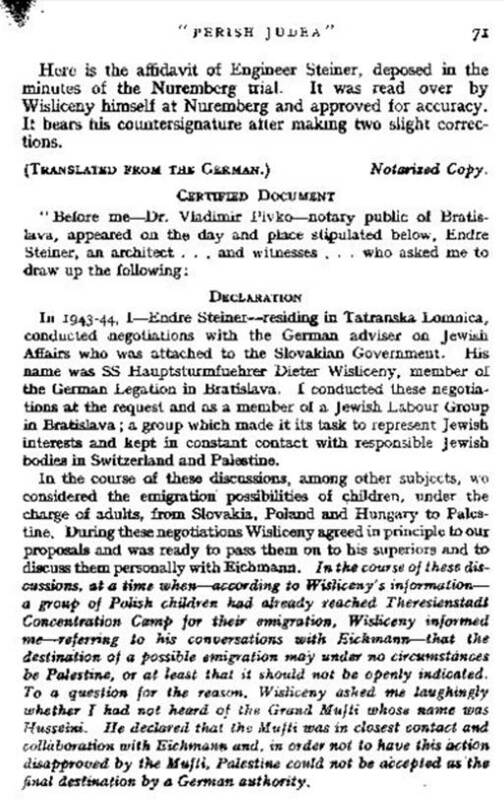 He had repeatedly suggested to the various authorities with whom he has been in contact, above all before Hitler, Ribbentrop and Himmler, the extermination of European Jewry. He considered this as a comfortable solution of the Palestine problem. In his messages broadcast from Berlin, he surpassed us in anti-Jewish attacks. He was one of Eichmann’s best friends and has constantly incited him to accelerate the extermination measures. I heard say that, accompanied by Eichmann, he has visited incognito the gas chamber at Auschwitz. “In a speech to delegates at the 37th World Zionist Congress in Jerusalem on Tuesday, the premier claimed that Hitler's original intentions were solely to expel the Jews. This has created a storm. Immediately, authorities of all sorts were quoted in the media stating that Netanyahu’s claims were outrageous and untrue. I will examine the outraged reactions in a future piece. Here, I examine Netanyahu’s claim in light of the available historical evidence, so that readers may form an opinion as to whether they are true. For context, I begin with a short summary of what is not in dispute. First, Hajj Amin al Husseini is the father of the Palestinian movement, and mentor to such figures as Yasser Arafat and Mahmoud Abbas, the current leader of this movement. Second, Husseini organized several mass terrorist attacks against the Jews in British Mandate Palestine. The first was in 1920. 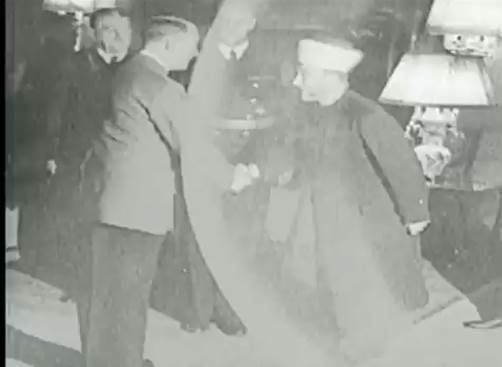 Then, after the British made him the Grand Mufti of Jerusalem, he used that position to launch new terrorist attacks in 1921, 1929, and 1936-39. The last was called the ‘Arab Revolt’ and Husseini and allies waged it with weapons supplied by Adolf Hitler. Third, after he left the Mandate in 1939, Husseini went to Iraq to organize a pogrom against the Iraqi Jews that destroyed the Jewish community there (the Farhud). 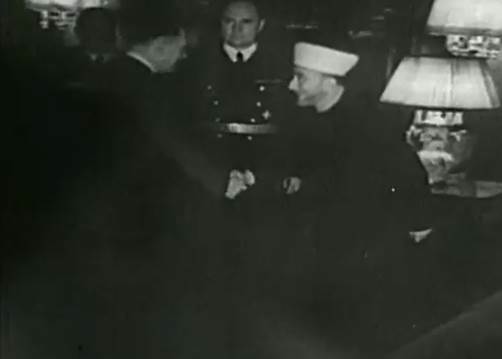 Fourth, Husseini traveled to Italy and then to Berlin, where he was received with full honors and sat down for a high-profile chat with none-other than the Führer himself. The Nazi film (included in the documentary shown at top right) and a Nazi memorandum of this meeting both survived. 1. He (the Führer) would carry on the battle to the total destruction of the Judeo-Communist empire in Europe. 2. At some moment which was impossible to set exactly today but which in any event was not distant, the German armies would in the course of this struggle reach the southern exit from Caucasia. So Husseini got assurances from Adolf Hitler that the German Nazis would exterminate the Jews in British Mandate Palestine. This is what the father of the Palestinian movement most wanted. 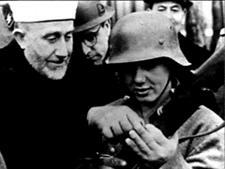 Fifth, Husseini spent the rest of the war in the German-occupied sphere and played an important role in Nazi propaganda inciting Muslims on the German radio to murder Jews. Sixth, he recruited and supervised the formation of large SS divisions made up of Bosnian and Albanian Muslims that participated in the massacres of the Yugoslav chapter of the Holocaust (photographic evidence for these latter activities is abundant, and may be found on the internet). All of the above points are uncontroversial, and for those not specifically footnoted here you may consult the relevant documentation in a different HIR article. You may also consult the documentation put together by The Nation in the 1947 article reproduced at right. 1) Did the Nazis, as Netanyahu claims, initially mean to expel the Jews, rather than kill them all? 2) Did Hajj Amin al Husseini, as Netanyahu claims, convince the Nazis to abandon the expulsion programme for a death camp system that would kill every Jew? There is very little controversy on the point that the Nazis initially meant to expel the European Jews. Thus it seems that, until the fall of 1941, to the Nazis ‘Final Solution’ still meant pushing most of the Jews out. As explained in another HIR article on this question,[5a] a number of historians have concluded precisely this from the bulk of the evidence. It is true that a great many Jews were being killed on the Eastern front, and these deaths of course must be counted in what is called the Shoa (or ‘Holocaust’), but, according to these historians, “until the autumn of 1941” there wasn’t as yet a decision to kill all of the European Jews in death camps. 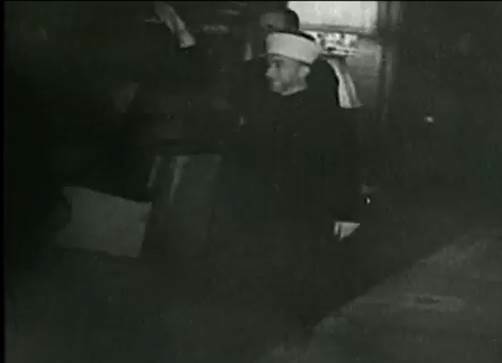 Husseini arrived in Berlin in “the autumn of 1941” (November 1941, to be precise). Husseini thus arrived right on time to argue powerfully in favor of what became the Wannsee Conference decision to kill every last living European Jew. This agrees nicely with Netanyahu’s claims. But, in fact, the evidence is even more agreeable than this to Netanyahu’s claims. 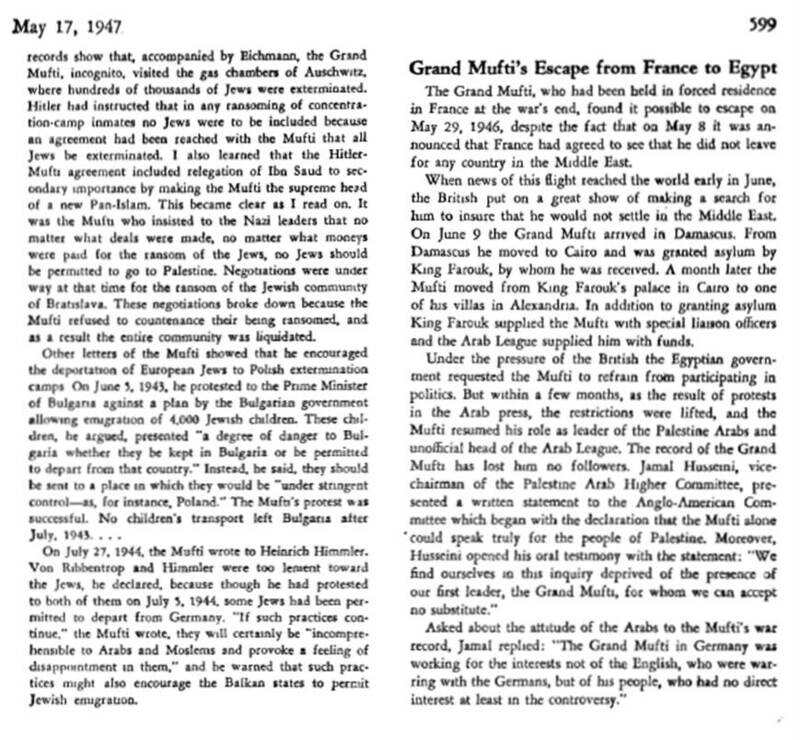 At his trial, Adolf Eichmann confessed that he made an early trip to British Mandate Palestine in 1939 to see if the Jews could be sent there. Another objective of his trip, he confessed, was to meet with ‘Grand Mufti’ Hajj Amin al Husseini. [10a] So Husseini had ample opportunity to argue influentially in favor of total extermination well before November of 1941, for he was in contact with the very Nazi leaders who wanted to send the Jews to Palestine much earlier than that (something that is obvious, anyway, from German Nazi shipments of weapons to Husseini’s terrorists during the so-called ‘Arab Revolt’ of 1936-39). 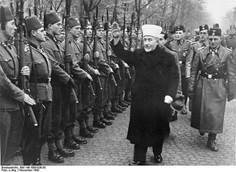 Nothing necessarily hinges, therefore, on Husseini’s arrival in Berlin, or on the exact date of the first killings to be labeled ‘Holocaust,’ as many seem to think. Finally, according to Dieter Wisliceny, right-hand man to Adolf Eichmann, Husseini did contribute to the Nazi decision to create a death camp system, precisely in the manner that Netanyahu claims. 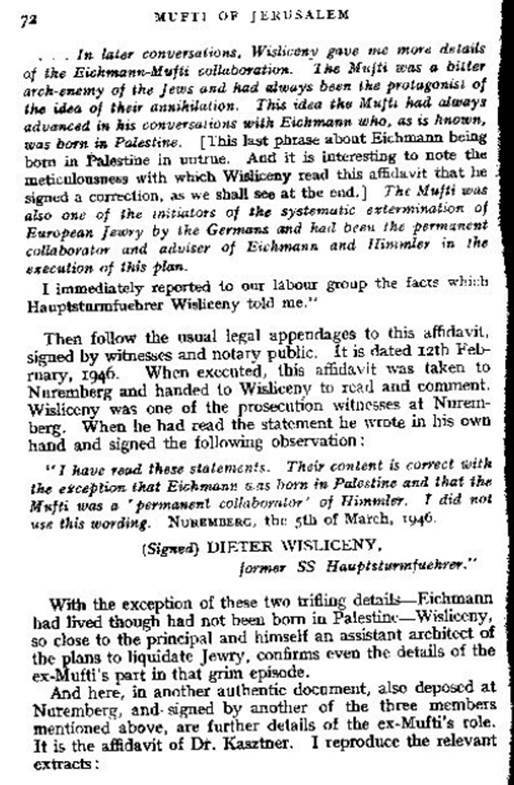 Wisliceny, an eyewitness to the relationship between the Mufti Husseini and Eichmann, agreed to everything that Steiner had said except for the bit about Eichmann having been born in Palestine and about his relationship with Himmler. 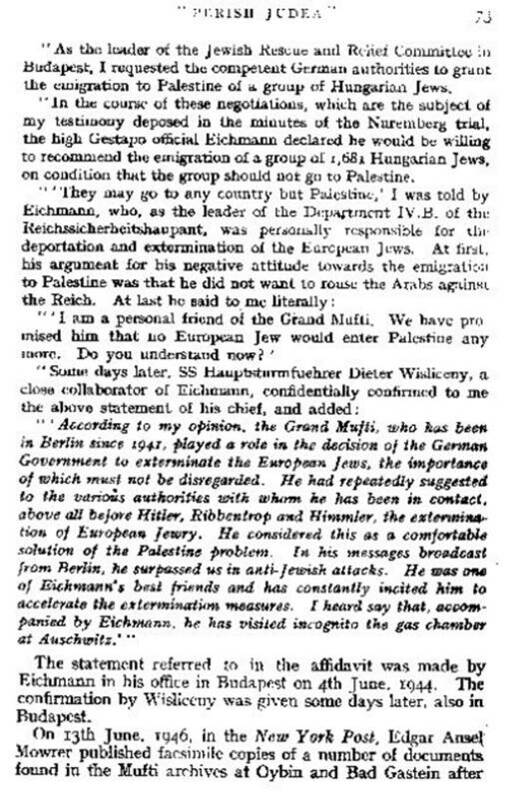 So Wisliceny agreed that “The Mufti is one of the originators of the systematic destruction of European Jewry by the Germans”—in other words, that he had played an important role in the decision to set up the death camp system. Is this article useful? Help us do more with a donation . Would you like to be notified of new articles? Sign up (it’s free) . Those who disagree with Netanyahu cannot simply express ‘outrage’ and claim, in the abstract, that Netanyahu is wrong. No matter that they consider themselves great ‘authorities’ invested with institutional prestige. 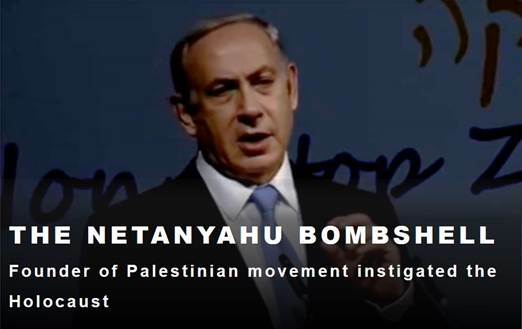 No matter that they claim to speak for Yad Vashem, or ‘Holocaust survivors,’ or the ‘Jewish people’ or ‘real’ or ‘serious’ historians—or any other category of presumed scientific or moral authority which they hope will seem like a big enough stick to beat Netanyahu with. The sources are the sources. If Netanyahu’s detractors wish to disagree with the sources that support his claims, they must speak directly to their content and make a specific argument. That is the sport of historical interpretation. We’ll be waiting. In closing, I will add that I find the moral arguments brandished to attack Netanyahu especially interesting. And they are most revealing, I believe, about a number of things, including who really has influence over media content, and which forces are ultimately responsible for shaping Israeli politics. I explain these matters in the next piece. NEXT: Part 2 | Did Netanyahu absolve Hitler and trivialize the Shoa? How did the 'Palestinian movement' emerge? The British sponsored it. Then the German Nazis, and the US. Has the US ruling elite been pushing a pro-Nazi policy? 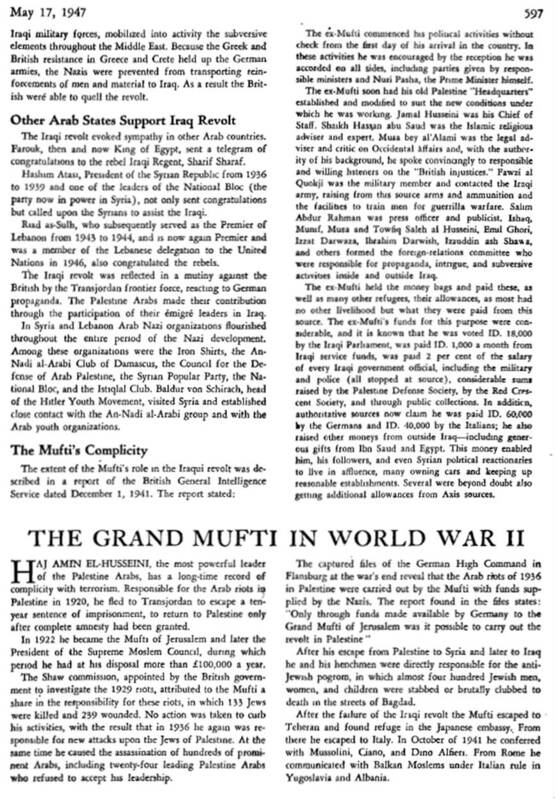 “Palestinian mufti convinced Hitler to massacre Europe's Jews, Netanyahu says”; Jerusalem Post; 21 October 2015. Black, E. (2010). 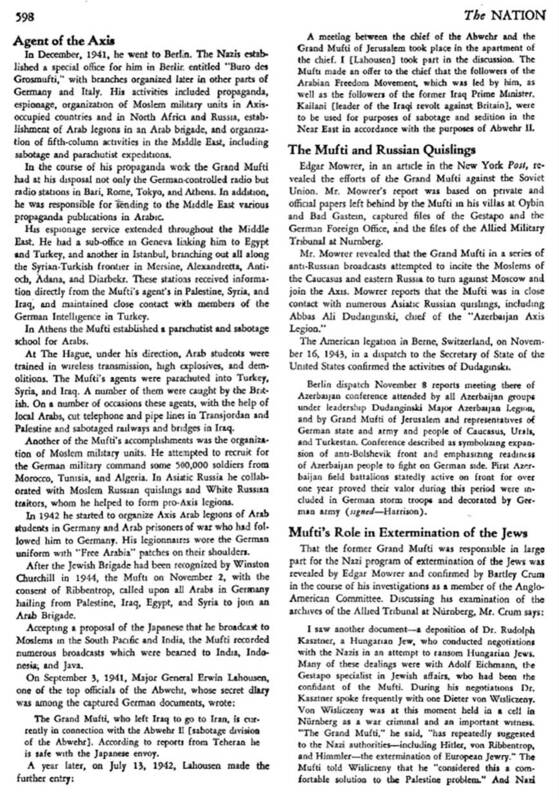 The Farhud: Roots of the Arab-Nazi Alliance in the Holocaust. Washington DC: Dialog Press. SOURCE: The Trial of Adolf Eichmann, Sessions 6-7-8. [Prosecution lawyer] Q. You have told us of your programme to “put soil under the feet” of the Jewish people. I assume that this was not your personal invention. Could you tell us who were the righteous men who conceived this programme: Heydrich, Himmler, Streicher, Rosenberg - which one of them? [Eichmann] A. As far as I know, at that time, when I tried to sell this idea within the Service, no one else expressed it. A. At that time, in any event, I did not hear it from anyone else and I also know that this idea was, at that time, ridiculed and scoffed at by some. My impetus came from Adolf Boehm's book, and there I recognized the root of all evil in the homelessness of this people, and I made no bones about it, within my official sphere of service. Q. And a clear expression of the need to give this people a homeland, you gave, for instance, in the report about your journey to Palestine in 1939, correct? A. This is not my report. I have said so myself, and it was confirmed recently in testimony by the person who had then been the superior in command of both myself and the author. Q. That is not correct, but let me refer only to what you have stated. You have said, in your interrogation, that this report had been corrected by you in your handwriting. This appears on page 341 and 342 of your Statement, where you said that the report had been shown to you before being passed on. Is that correct? A. I corrected it, but only the spelling, as one can easily find out. Q. Your journey was designed among other things, to establish contact with Hajj Amin al-Husseini, isn't that correct? A. The purpose was, first, to get to know the land and its people, and secondly, to establish contact with all kinds of persons. Q. I am talking about Hajj Amin al-Husseini. A. If this were possible, yes, that too, of course. Q. One of the objects of your journey was to establish contact with Hajj Amin al-Husseini, is that correct? "Yes" or "no"? SOURCE: The Trial of Adolf Eichmann, Session 90. The Steiner testimony appears in Session 50, part 7, of the Eichmann trial transcript.